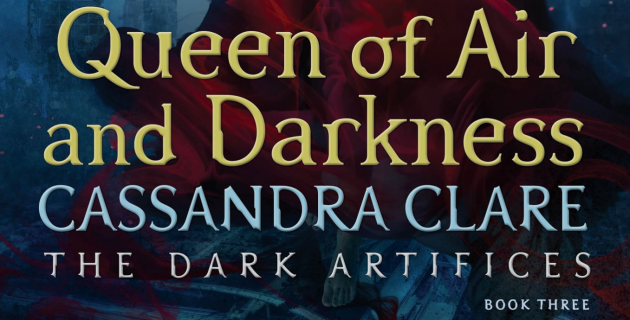 Today, thanks to Cassandra Clare and Audible, I do have a deleted scene from Queen of Air and Darkness for you! Cassie shared this brief scene at the end of an interview she did with Audible. It was Emma’s turn to grab a knife. She threw it hard, viciously, and it hit the wall hard enough to crack the wood. *sighs* This makes me think of Livvy’s locket that’s displayed on the Livia’s Watch banner. What is your world-building process like? How do you go about deciding things like the aging process for warlocks? When I sketched out City of Bones, I wanted to write something that would combine elements of traditional high fantasy — an epic battle between good and evil, terrible monsters, brave heroes, enchanted swords — and recast it through a modern, urban lens. So you have the Shadowhunters, who are very classic warriors following their millennia-old traditions, but in these urban, modern spaces: skyscrapers, warehouses, abandoned hotels, rock concerts. In fairy tales, it was the dark and mysterious forest outside the town that held the magic and danger. I wanted to create a world where the city has become the forest — where these urban spaces hold their own enchantments, danger, mysteries and strange beauty. The world of Shadowhunters has really grown since then—with each book I’ve expanded the tapestry a bit more. That happens organically through the plotting of the books—I’m always on the lookout for ideas that I feel would be a natural fit with the Shadowhunter world! Did everything in the book fan out as planned or did you have to change some things you weren’t expecting to change? How is the shadow world different now from when you first came up with the idea in your head? I am a big believer in outlining, so I always have a general sense of what is going to happen. But books definitely do evolve as you sit down to write them—that’s part of what makes them fun. They can surprise you. Like Magnus—he was supposed to be a minor background character, but as soon as I actually started writing him, he moonwalked onto center stage in a purple rhinestone jacket and was like, “Oh, hello, I’m here to be in every Shadowhunter book you write from this moment on.” That was a great surprise! The world has changed a lot. I build it out a little more with each book. I love writing historical Shadowhunter novels, so I’m having fun working on The Last Hours, which is a trilogy set in the Edwardian era. Each time I do a historical project, more Shadowhunter history gets fleshed out. How did you feel during the first years of publishing your books and the reactions of your fans? And how do you feel now? If you had to compare the level of pain we’re going to feel in QoAaD with some film or book, what would it be? I’m rereading TDA because QoAaD is coming next month and my question is: do you think our suffering is funny? Because OMG THESE BOOKS ARE JUST SO CRUEL. This animated GIF pretty much sums up my feelings about Queen of Air and Darkness. I’ve always loved books that provoke strong reactions in me—happiness, amazement, even sadness. But I can’t predict how anyone else will feel when listening! I’m really not sure what to think of this gif! Only four more days until Queen of Air and Darkness is released!